Lord Byron's embalmed body lies within this medieval church. Lord Byron, the popular English poet, politician, and freedom fighter, often considered “the world’s first celebrity,” was laid to rest in relative obscurity. Owing to his scandalous private and romantic life, the much-loved yet controversial poet was denied burial with his peers in the “Poet’s Corner” of London’s Westminster Abbey. He had died in Missolonghi while fighting for Greek independence from the Ottoman Empire. Surreal riveted sea forts once protected the Kent shores from German attack. 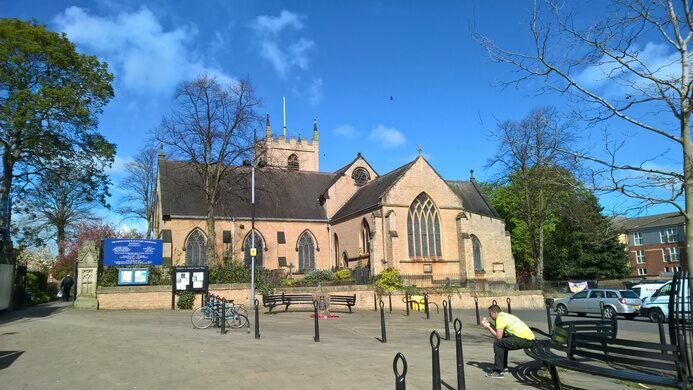 The clergy of the tiny church of St. Mary Magdalene in Hucknall, England, were less discerning in their interring than their London counterparts. So, after the poet’s embalmed body finally returned to English shores, many notable and wealthy mourners surprised this unsuspecting Nottinghamshire backwater by showing up for the funeral of the century. The vault of this tiny 12th-century sandstone church had been the final resting place for generations of the Byron family, who had owned nearby Newstead Abbey since 1540, when it was gifted to them by Henry VIII. 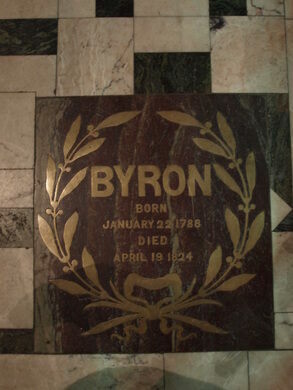 Within the serene interior of the church, an old plaque set into the church floor lies close to the entrance to the Byron family vault. The vault was last opened in 1938 by Cannon Thomas Barber, who reported that the poet’s body had been so well preserved after his death that his features were still clearly discernible. There is a small museum corner in the church with a few artifacts from the poet’s life and death, including a lock of hair and part of his shroud. 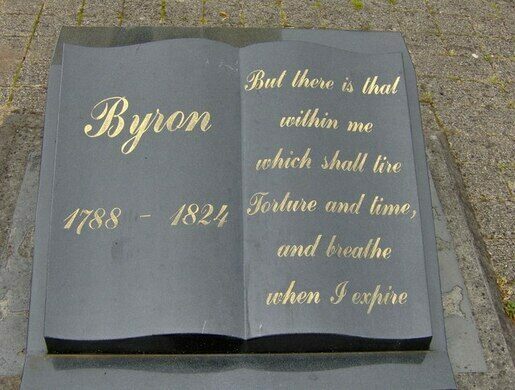 Tributes to Lord Byron are speckled across the church grounds as well. Perched high in an alcove overlooking the Church and Market is a statue of the poet. Out in the leafy squirrel-packed graveyard next to the town’s marketplace is a memorial garden dedicated to the heroic bard, complete with a faded black monument representing an open book bearing a simple epitaph. Byron’s estranged daughter was also interred in the church vault, according to her wishes. A Victorian mathematician of exquisite mind, Ada Lovelace is credited as being the world’s first computer programmer, having created the algorithm used in Charles Babbage’s analytical difference engine in 1843. Hucknall is well served by public transport from Nottingham City Centre, being the northern terminus of the city's tram network. It also has a number of services from Nottingham Victoria Bus Station and a railway station on the Robin Hood Line (Nottingham to Worksop). Those hungry for more Byronic links shouldn't miss visiting the poet's nearby home of Newstead Abbey, or the two Byron-themed pubs in the town, the Byrons Rest, opposite the Church, and Boatswain's (named after the poets beloved dog) on Watnall Road. The ancient Red Lion, Hucknall's oldest pub was once the Byron family's rent house and is quite possibly the only building in the town the poet visited in life. This romantic, decaying 13th-century ruin on the edge of Sherwood Forest is reputedly one of England's most haunted places.